Presidential election results map. 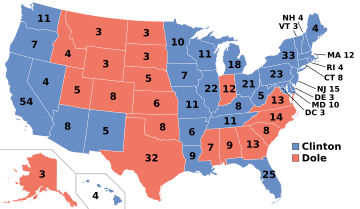 Red denotes states won by Dole/Kemp, Blue denotes those won by Clinton/Gore. The United States presidential election, 1996 is a political event which took place on November 5, 1996. During that day the President of the United States and Vice President of the United States were selected. The election was between President Bill Clinton of Arkansas and Vice President Al Gore of Tennessee and the Republican national ticket of former Senator Bob Dole of Kansas for President and former congressman and ex-Cabinet Secretary Jack Kemp of New York for Vice President. 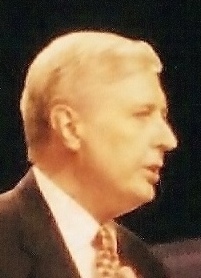 Businessman Ross Perot ran as candidate for the Reform Party with economist Pat Choate as his running mate; he received less media attention and was excluded from the presidential debates and, while still obtaining substantial results for a third-party candidate, by U.S. standards, did not renew his success in the 1992 election. Clinton benefited from an economy which recovered from the early 1990s recession, and a relatively stable world stage. On November 5, 1996, President Clinton went on to win re-election by a substantial popular vote margin with a large electoral college victory. President William Jefferson Clinton went on to win re-election relatively easily despite becoming the first sitting President since Woodrow Wilson in 1916 to do so with under 50% of the National Vote (49%), while winning enough states to earn him 379 Electoral Votes. Sen. Robert Dole from Kansas ran for the Republicans and was at the mercy of peaceful over sea's relations and a thriving economy. He gained (41%) of the vote, while winning enough states to win 159 electoral votes. The GOP did well in the congressional races however thus effectively positioning themselves for the 1998 mid terms and the subsequent 2000 race for the White House. United States presidential election, 1996 Facts for Kids. Kiddle Encyclopedia.